The goal of school revitalization is to strengthen Catholic identity and academics, establish school models that will stabilize and grow enrollment, and place schools on a solid financial foundation. "By 2013-14, in a collaborative effort, school, parish and diocesan leadership will right-size the number and location of elementary school buildings to address the demographic realities, attain defined optimal enrollment per building and achieve financial stability." September, 2013 - The Next Steps outlines the major goals of Catholic School Revitalization which will further strengthen Catholic identity and academics, as well as address finances and school governance. November 6, 2013 - Update #1 introduces the Revitalization process and identifies cluster meeting groups. November 20, 2013 - Update #2 outlines the School Profile Report, a key tool being used for cluster discussions. December 5, 2013 - Update #3 discusses the decrease in public elementary school enrollment in Western New York and Catholic elementary school enrollment in the Diocese. December 18, 2013 - Update #4 A look inside our Catholic Schools. Beginning this spring, three long-term projects will be introduced in order to change and improve the Catholic schools of the Diocese of Buffalo. January 15, 2014 - Announcement contains the list of school closures, talks to generate new scholarships, Catholic elementary schools in Buffalo remaining open and Bishop Malone's call for approval of Investment in Education Tax Credit. January 28, 2014 - Recently 2,542 parents, guardians and other members of our Catholic school communities completed a survey about the future of Catholic schools in the Diocese of Buffalo. Respondents answered questions on a variety of topics related to the education of our elementary school children. This update contains highlights from the survey. March 23, 2014 - Bishop Malone discusses the Revitalization process and the strengthening of Catholic schools. May 15, 2014 - The Vatican Congregation for Catholic Education has upheld Bishop Richard J. Malone's Jan. 15, 2014, decision to close St. Bernadette School (Orchard Park), St. Francis of Assisi School (Tonawanda) and St. Mary of the Lake School (Hamburg). 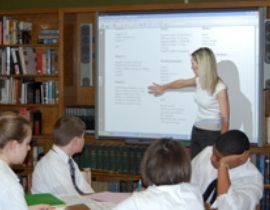 Visioning for the Future - Catholic Elementary Schools Strategic Plan - "The Meitler Report"
November, 2009 - Phase I of the Diocese of Buffalo's comprehensive strategic plan highlighting the challenges of the Catholic Schools. Diocese Of Buffalo Elementary School Network Analysis: Phase II - "The Verdi Report"
June 30, 2010 - Phase II of the Diocese of Buffalo's comprehensive strategic plan focuses on the economics of the school system, market and demographic conditions, school system financials and economics and capacity for change. The Center for Catholic School Effectiveness, School of Education, Loyola University Chicago, in partnership with Roche Center for Catholic Education, School of Education, Boston College (March 2012). "Faith in Tomorrow" represents the new vision for Catholic elementary schools in the Diocese of Buffalo.